Open Europe: Open Europe Berlin: one to watch! This is exciting stuff. As we've argued repeatedly, the future of Europe will largely be decided in Germany, as that country goes through a very dynamic, internal debate. 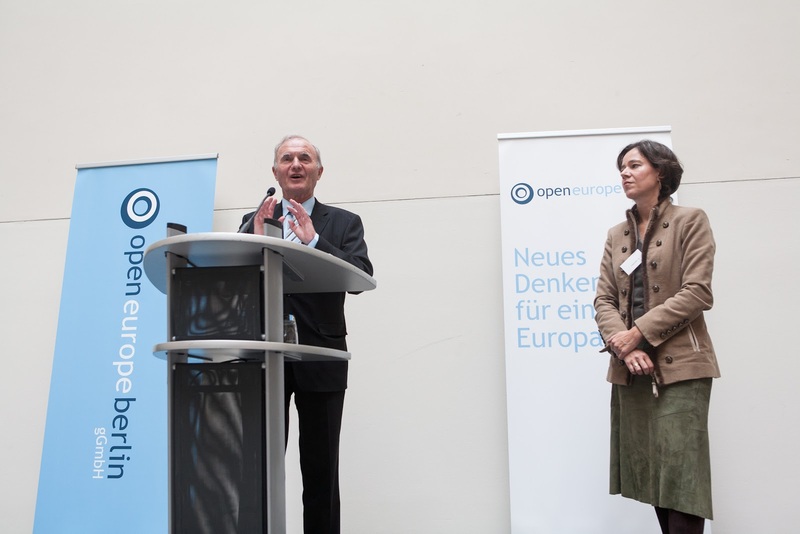 Which is why Wednesday's launch of Open Europe Berlin gGmbH, Open Europe’s new independent partner organisation, was so incredibly timely. 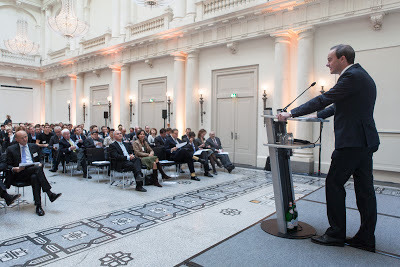 220+ journalists, policy-makers, business leaders, academics, diplomats and others crowded at a packed Hotel de Rome in Berlin, to listen to OEB Director Prof. Dr. Michael Wohlgemuth and the keynote speaker Otmar Issing, former chief economist at the ECB. Instead, he said that failures within the euro were structural and were not caused by ‘financial speculation’, and that member states had to deal with their own problems rather than trying to move them to the European level. Issing also criticised the EU Commission’s “deeply absurd” rush towards establishing a banking union. He added that the proposed ‘Chinese wall’ between supervision and monetary policy at the ECB was “illusionary”. 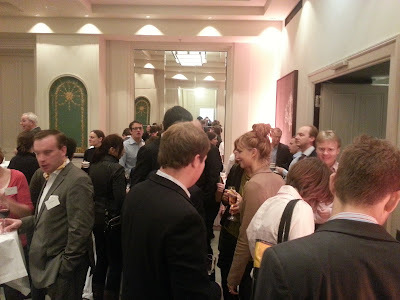 The full video of the launch event is available here (auf Deutsch). For German media coverage of the launch, see here. Germany need more a proper opposition party or one that at least can start the discussion on issues like that. Die Linke and the Pirates are absolutely undigestable for the majority. Main possibility would be a reprofiled FDP. They have the organisation and are not seen as weirdos (as totally uncompetent and worldchampions u-turn but not weirdos). But their leadership is so extremely poor makes Clegg looks like a statesman. But they will be forced to do something and effectively they need only one good guy to pull the voters in. One good guy that attracks votes and a reprofiling will gain them most likely a lot of seats and will wake up the German political arena. A FDP as right (or even more right) as the CDU only no Christian foundations, more business oriented and socially more liberal. A Wilders party is another option but such a one should always be kept out of the government (which is a real risk) as it attracks a lot of 'funny' people and remain a bit of a weirdo party. But no German Wilders insight as well btw. Funny that it may be the Germans who liberate European countries from an un-lected dictatorship. Rik is right. A reprofiled FDP can show the way. It may not become the majority party, but it would force the main parties to drop socialism and the disastrous Euro-federalist project. Germany is at an historic moment in which it can lead the world away from socialism and disaster, for which the rest of the world would be eternally grateful. I hope there is someone in Germany who will lead. 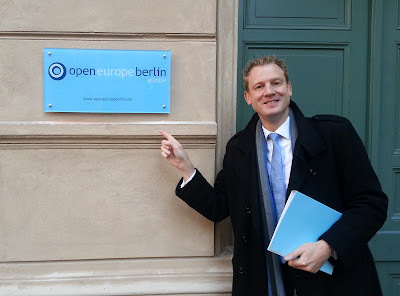 The formation of Open Europe Berlin is the best news I have heard this year. At long last there is a voice of reason and common sense in Germany which it is hoped will help to change the disasterous course that the EU is set to inflict on the peoples of Europe. At last! An Open Europe voice in Germany is badly needed. I support a single EU market but it is clear that we are marching towards the creation of a United States of Socialist Europe (USSE) by default. It took 70 years to see the demise of the USSR. Learn from history...don't repeat this mistake. Bureaucrats in the Commission need a democratic mandate for this vision. They don't have this and are frighten to ask. Anything imposed by stealth by a deluded political elite, or by economic force (to save the euro) will surely fail, just as we saw the disintegration of the USSR.